When somebody who's been going to shows for thirty some-odd years says he's just been to the best one he's ever seen, you take notice. And when he comes back for more, not just once or twice, but *three* more times in the same month, the band in question has to be something special. And they are. 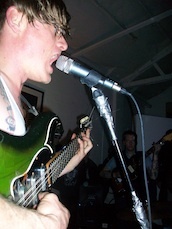 This is the first of a series of four bcingyou recordings of Thee Oh Sees from March of 2010. Enjoy! Recorded directly in front of singer/guitarist John Dwyer, band and audience at floor level. 12. Warm Slime (Summertime Jam), at the 9:12 point the recording drops to mono due to mic connector 'pops' in one channel. Video footage here. Is there anyway you can reupload these Oh Sees recordings? I have a long-term project to refresh the audio links for these shows. Since they're not my recordings, I'll have to see if I can reshare them on YouTube. You have a somewhat better chance writing into requests@atmyheels.com and letting me know which shows you'd like.